The Nant Single Malt, Cask Aged - Unpeated 50ml sample. Here is another little whisky I was saving for Dramcember, The Nant Single Malt Whisky, Cask Aged - Unpeated. I won this 50ml bottle a couple of months ago as part of a Nant facebook competition The Nant was running. Though yes I have had The Nant before, it has always been at a whisky event, muddling with other whiskies at the time. This is the first time I have been able to sit down and genuinely dram the whisky and examine its character. 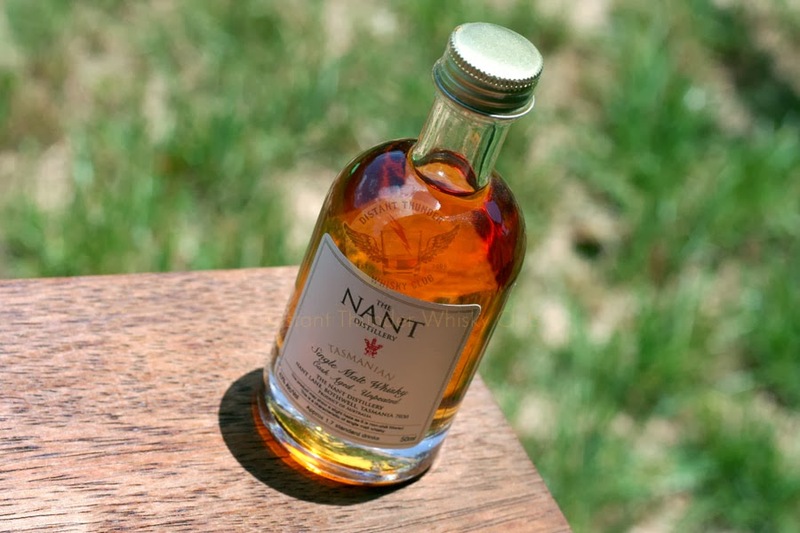 Established in 2004 The Nant is of course one of the many new age Australian whisky distilleries coming into the market. The Nant Distilling Company, apart from making a great whiskies, also has taken on the Australia wide intuitive of creating The Nant Whisky Cellar & Whisky Bars. A sure thing to check out if you have one in your local city. Research wise unfortunately your not going to get much out of The Nant website at all so if you don't know much about the distillery or the bottlings your best to head to one of The Nant Whisky Bars or track them down at an event like Whisky Live. Nose: Ripe bananas, new oak honey cream roundness, toasted toffees, with an essence star anise spice. Taste: Rich soft creams in the forefront, a somewhat dense middle of toasted oaks before merging into a high dry spice in the upper rear palate. Mouth puckering and chewy as the dryness intensifies which is not a bad thing to balance out the initial sweetness. The spice does remind me a lot of a rye whiskies finish. Finish: Long and dry that mainly sits in the lower throat. A tingle intensifies on the lips as a citrus zest comes to the mouth feel well tasting. Overall pretty good balance with some sharp and soft notes. It is an enjoyably challenging whisky even though it seems a little young with all the citrus zest vibrancy. On the 2nd and subsequent drams these high and low notes become even more apparent that continues to energise the overall experience. A truly excellent whisky to be had. From what I recall the pricing was not in the every day affordable bracket we would like to see of our local products. I would hope as stocks build that The Nant starts to position itself for us average punters to enjoy and support the Australian whisky revival. If I was to give a dram 5 1/2 out of 7 as pricing and availability are the real things dragging it down.